I recently wrote a post about how Greek Yogurt has come from nowhere to take our grocery stores by storm. However, I was focused on the food nutrition aspect, not the food marketing elements. Although a departure from my normal subject matter, I wanted to share some insights via Gini Dietrich(@ginidietrich). Gini is the founder and CEO of Arment Dietrich, a Chicago-based integrated marketing communication firm. 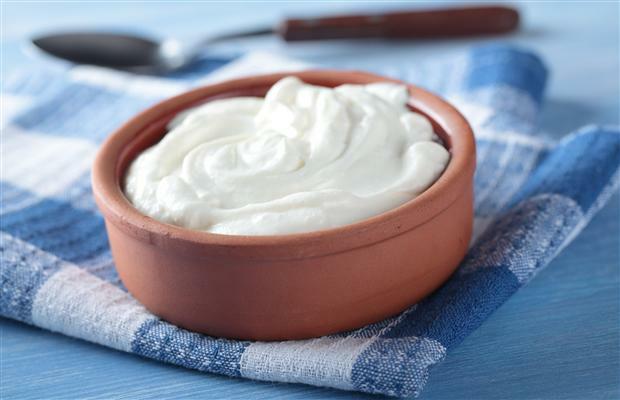 She recently tweeted out a blog post from the Harvard Business Review Blog Network entitled: Why the Greek Yogurt craze should be a wake up call to Big Food. Well thank you Gini! It put a whole new perspective on why we should all be paying attention to Greek Yogurt. Not only is it the newest superfood, but it’s changing the way “Big Food” should be marketing products. In the HBR Blog, authors Manny Picciola and Stuart Jackson tell the story of Hamdi Ulukaya who bought a factory in 2005 to produce a line of Greek yogurt called Chobani. In no time, this company has given “Big Food” a run for their money. I’ve put below some of Picciloa and Jackson’s “lessons to Big Food”, however, please read the entire article – it’s succinct and thought provoking…and may just make you hungry for the newest superfood! Give up some control and get nimble. End your obsession with ingredient cost. Put the product ahead of the brand. The Cookbook Magazine – how did they know I was looking for that! 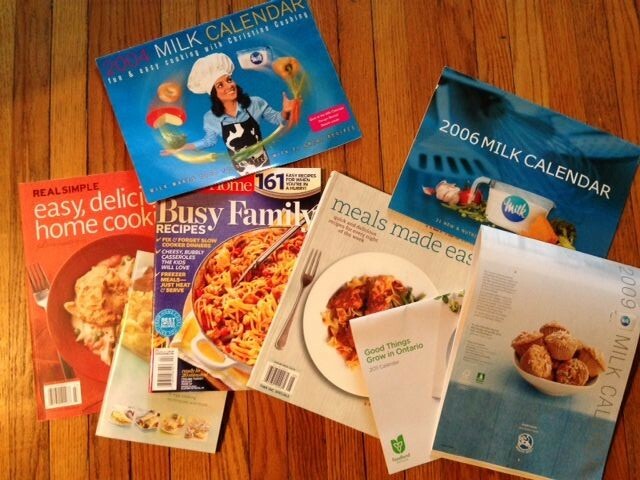 I get that the Annual Milk Calendar is a giant promotion for milk products…but I still love it! I also get it honestly. You may note in the picture that the calendars are from 2006 and 2004 – yes, I raided my mom’s stash when they sold the family homestead! I recently picked up the “Busy Family Recipes” cookbook magazine put out by Taste of Home Magazines. There is also Taste of Home Canada….likely because the marketing gurus at Taste of Home figured out that Canadian and US families have different things that make them pick up a copy! I hate to admit it, but they have indeed figured out exactly what I’m looking for – simple, easy, small number of ingredients, healthy(usually) and 9 times out of 10 – kid friendly. The downside is that they all look so wonderful with the glossy pictures that I can’t figure out which one to try first! Julia Child is an icon for a reason! What an icon in the cooking show world! Check out this 1987 clip from YouTube of Julia Child on Letterman – she fully holds her own….although I’m not sure about eating the raw ground beef! I also found a great article from Huffington Post of her most memorable TV moments for her 100th birthday – just awesome! Cooking shows – What’s YOUR favourite? When I was on maternity leave with both my daughters, the cooking channel was on a lot. I watched those shows as I’m sure a young hockey fan watches an NHL game – thrilled by the action, awed by the skill, and inspired that I too – one day – could cook with such ease and satisfaction. Cooking shows are mainstream – see here for the top 20 – you’ll recognize at least 5 from prime time TV. Celebrity Chefs are right up there with movie stars as the paparazzi follow their successes and scandals. Almost every day, I watched Chef Michael Smith’s “Chef At Home” on the Food Network. I “ate up” what he was trying to teach me: keep it simple, have fun and don’t worry about mistakes. In this Huffington Post article “8 Things We Learned From Chef Michael Smith,” he talks about making food fun again and wanting to inspire people to eat healthier – well…I hear you! In this Gourmet TV video, he also gets into what he is trying to do with food – it’s way more than just sustenance – his conviction and passion are compelling. Because my relationship with food is much more adversarial, I’m trying hard to buy into his philosophy. It’s 5 min, but worth a watch! Not sure how many times I have to make that mistake before I remember not to ask. So – I look in the fridge for some pitas and sauce…nothing. 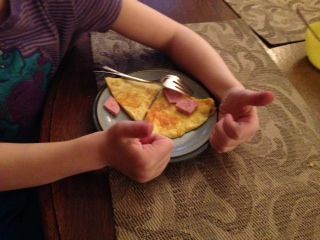 But my eyes land on the eggs, and the hamsters in my brain jump on the wheel – an Omelette pizza! So, I load the kids up with carrot sticks to finish their show and get crackin’! 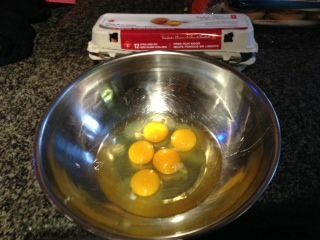 First Step: The Eggs expertly cracked…which almost never happens. 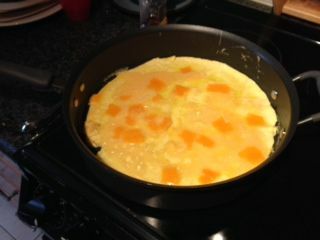 So, my Third step step is the flip – very delicate point in any chef’s attempt to make a perfect omelette. 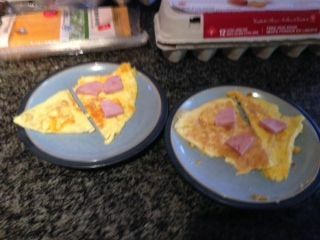 Well, it didn’t go well…but let’s just say that it fit right into my plan to cut the omelette into triangles like pizza slices: BRILLIANT! So, there I am, ready to feed my baby birds, wondering if there is going to be a classic “WHAT IS THIS?” reaction accompanied by a terrible expression. Well – I got a TWO THUMBS UP!!! It was delicious, and I felt the warm rush of satisfaction of having fed my brood a healthy, yummy, made from scratch meal. In 2007, when my eldest daughter was just starting out on solid food, I making something that called for Greek yogurt. The cookbook boasted of this new superfood’s great protein and nutrients. Wanting to be a “superparent”, I thought “Ok” – not really knowing the difference from other yogurt – “I live on the Danforth – otherwise known as Greektown , I should be able to find it.” Well, I remember that it took me 3 stores before I found it…and even then, it was a “health food” tucked behind the tofuturkey and soy cheese. How times have changed! Now, major grocery stores have entire Greek yogurt sections! Marketing firms are calling it a Greek Yogurt Revolution, and media outlets like the Huffinton Post have 2 pages of “tags” for Greek Yogurt! What is going on??? I jumped wholeheartedly on the Greek yogurt bandwagon. It’s my go-to mid morning snack. I feel full and virtuous all at the same time – what could be better!? Of course, most of the superfood lists that celebrate Greek yogurt also warn of the perils of sugar. (see my recent posts on The Hate on Sugar). We eat a massive amount of yogurt in our house – we usually have a whole shelf devoted to the stuff – Greek and otherwise. It’s easy, yummy and healthy – all good! With the explosion of yogurt at the grocery store, I spend a lot of time in the yogurt section. I look the nutrition labels, the different flavours and sweeteners. So much choice…would it be ok to eat yogurt at every meal? You bet! The Hate on Sugar – Part 2: It’s not the sugar’s fault! So, my most recent post about sugar inspired me to take more than a cursory glance at my own pantry to see what is lurking there. Short answer: TOO MUCH SUGAR! In all honesty, I’m not sure how this has happened. There are the obvious ones: left over Halloween and holiday candy. 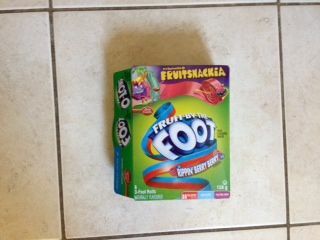 However, there are the things I just can’t hide from: The Fruit by the Foot didn’t get into my house by itself! Although the product claims to be an “excellent source of vitamin C” – it shouldn’t be the only way my kids are getting it. Time Magazine also lists it on “9 kid foods to avoid” – which of course I didn’t know until this minute! So – my first line of defense: Blame someone else. My husband did the shopping this week and he bought them. Easy solution here – better communication between the grown ups in the house. Second line of defense: This is a “special treat”. Yes, but the kids know exactly what they are and the different flavours available…so it’s not all that special anymore. Third line of defense: I don’t have one…and it’s not Betty Crocker’s fault. Food preparation takes planning and time. I need to invest this time in order to get the results I want. This is not rocket science, but is sometimes difficult when there aren’t enough hours in the day. Luckily, I’m not alone, and there are many resources out there to help me make nutritious choices that are good for our bodies and taste buds! A shout out to Fab Food Finds, a food blog that I’ve found super helpful. You can also follow them at @greatmealideas, and @food4happiness. Please share with me ones that you have found useful! The stories were interesting, and kept me watching, but it wasn’t revolutionary: as a society, we consume too much sugar, and it’s hidden in EVERYTHING! However, it did get me thinking about my current quest to cook more from scratch, and how I can reduce the refined sugar content in these meals. The biggest challenge is that sugar makes things yummier! Ketchup on meatballs – yum! Maple syrup on salmon – delicious! Chocolate chips in oatmeal bran muffins – Mom, you’re the best! So, where is this all going? The stories have certainly made me more attuned to the “secret sugar” in our food, but I’m not going buy into the hate on sugar just yet. 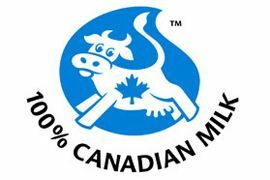 I do support the call for the food industry to provide more information on what’s in their food products. I also support the recent decision by the Ontario government to require restaurants to post the calorie count in their meals. 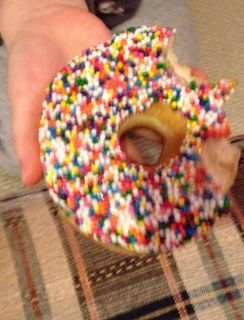 However, I don’t think sugar is the root of all evil, and I will continue to live by the rule of everything in moderation…..except when you win at Roll up the Rim! First off – I love her life-attitude of taking on new adventures and learning opportunities regardless of her age or any prior skill in whatever she is taking on. I also did a bit of research on her for this post, and look forward to picking up her most recent book – The Good House – which got a good review in the New York Times. The parallel to my cooking adventures are hard to miss – both with the actual cooking…and then blogging about it! The article is about her learning to play the banjo, which is her most recent new adventure. In the article, she talks about the Conscious Competence Learning Matrix which is a theory developed at the Gordon Training International organization, and according to Wikipedia, has been frequently attributed to Abraham Maslow. Like Ann, I found it easier to understand with this image to the right. Prior to having children, I would have put myself in the stage 1 box on the bottom left corner – Unconscious Incompetence. Incompetent at cooking, but not all that bothered about it – I was married to my job, worked long hours, ate the food from “lunch meetings” and bought dinner on the way home. Other ways of saying this are “blissfully ignorant”! 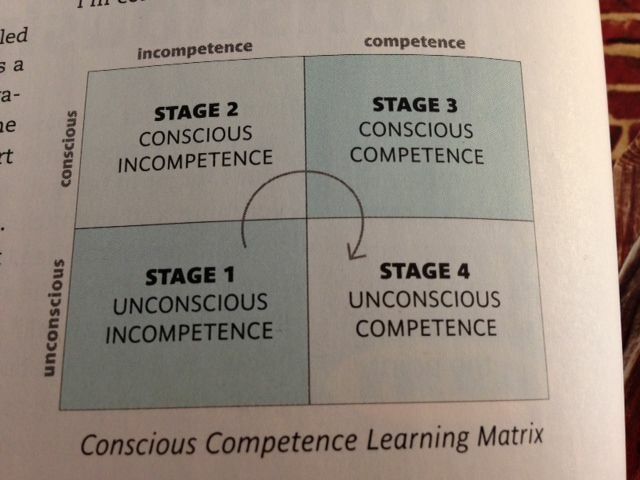 Now, like Ann with her banjo playing, I’ve moved up in the world to stage 2 – Conscious Incompetence. However, rather than feeling better for progressing along the chart – it feels worse. I’m now bothered by what I don’t know, and it feels like a brick wall has just been build in front of me! This is acknowledged as the most difficult stage, and as Ann writes, is often when people quit. I think Karma sent me this article to read. I will admit that between getting busy at work, and all of us being sick, the delivery man had crept back into our lives. I now feel a renewed sense of inspiration to get cooking! 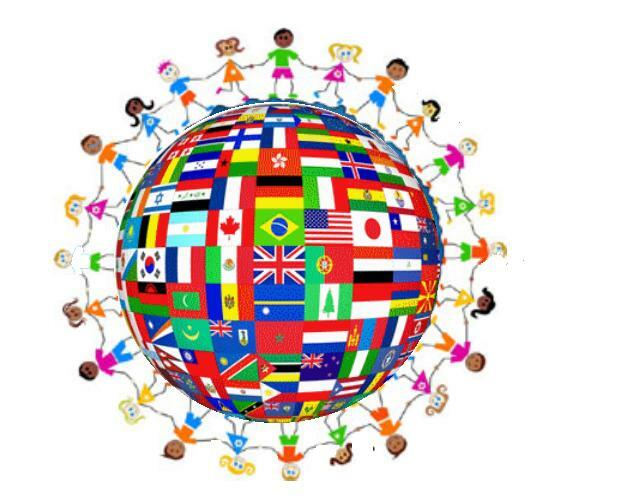 This week, our school hosted a multicultural lunch. I was initially grumbling a bit about this lunch. Am I supposed to make something? What is a “Canadian with Irish roots cultural” dish? How do I send it with her? Will I get my container back? Who has the time? 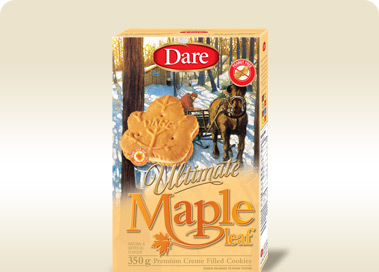 So, I will admit that I pretty much did the minimum required and sent her with a box of nut free maple leaf cookies(who doesn’t love them??!). Despite a small mix up with the cookies(they somehow didn’t get out of her bag for the first round), she came home raving about eating duck-yes-DUCK! Well, a big thank you to whichever parent took the time to make duck! A big thank you to my school for organizing it! We’re so fortunate here in Toronto to be exposed to so many different cultures and their food! A quick Google search, and I landed on a wiki site of Cuisine in Toronto – Amazing! I will be the first to admit that I am not a foodie. I rely on others to let me know what celebrity chefs have set up shop in Toronto. On a recent girls trip to NYC, my girlfriend made reservations MONTHS in advance…and it was worth it – ABC kitchen was incredible. So – the duck episode has taught me a couple things. Maybe I don’t have a picky eater, I just have an eater with exotic tastes. Also, I should take advantage of the food variety literally at my doorstep. Let me know if you’ve eaten somewhere awesome lately and we can all share the joy! My personal journey from fat to fit, including eating right, staying active and other health topics.